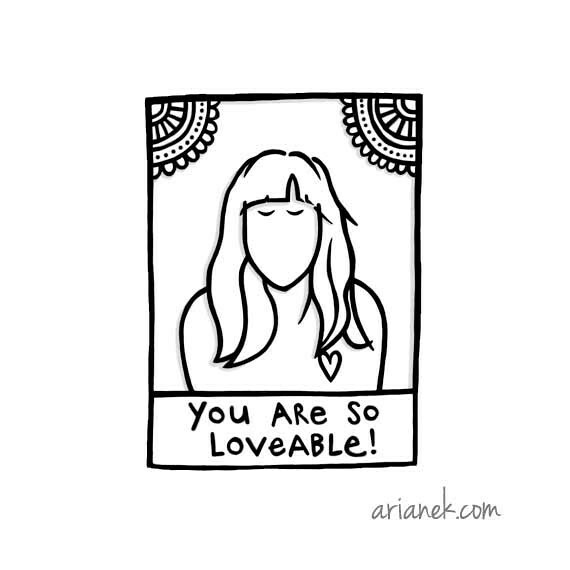 It's true: you are so you, and you are so loveable! Anyone who doesn't see it is a fool, and is sure missing out on all the goodness that is wonderful you. So love yourself, and love the people that truly love that loveable you. It might sound too good to be true, but you will always be lucky, because you will always have you! A little cheesy? Sure, but who cares! It's okay to go a little over the top when it comes to reminding yourself (or someone you love) that there is a very good, and very loveable person in there. 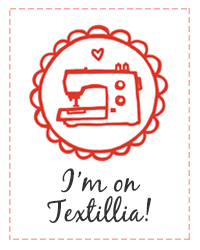 This Heartgirl was inspired by a friend of mine, named Sylvia - people in the knitting community might know her as amazing shawl designer Softsweater. Sylvia is one of those kindred spirits who I'm so glad to have met - we have a strange assortment of things in common that have laid the groundwork to make it feel like I've known her for far longer than I have. Last winter, Sylvia led a really amazing photography project for youth called the Lovable Project (you can read more about it here and here). Around that time, she was also doing some drawings that I fell in love with, so I got her to do a little commission of one of me... I think I needed a reminder of my own lovability (loveableness?) as I was struggling with my self worth, around my worsening illness and especially it resulting in my having to stop working for a while. As I started drawing Heartgirl sketches of people I know, Sylvia came up immediately as someone I wanted to Heartgirl-ify. It took me a little while of pondering what message would suit her - there were so many wordier and more poetic ones that I came up with... She's very generous with her support and encouragement, especially around boundaries and self care. She has this innate wisdom and self-awareness that is so hard to come by these days. I experimented writing many variations on those things. But it eventually came back to the inevitable, and I'm glad that she liked it: "You are so loveable!" She really is - it was meant to be. And it's an important message to spread into the world. I also played with different frames and border ideas for the drawing for a while, and kept coming back to the little corner adornments. Even though it's plain as day for me now, somehow I didn't initially see it - they look like round shawls!!! 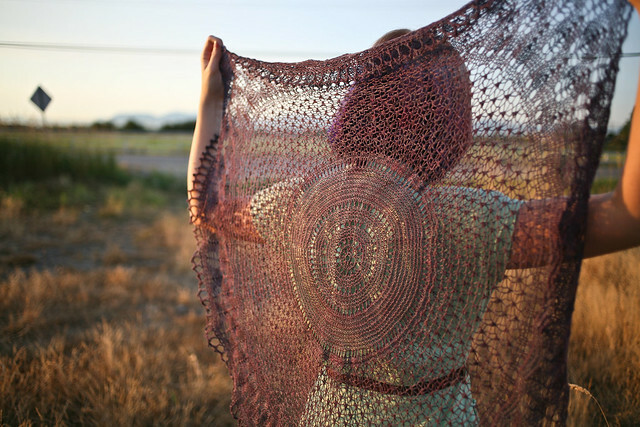 Couldn't be more perfect - I'm pretty sure I have my subconscious to thank for that, as I was obsessively in love with a round shawl that Sylvia designed last year... How beautiful is this??? Right??? This gal is crazy talented. 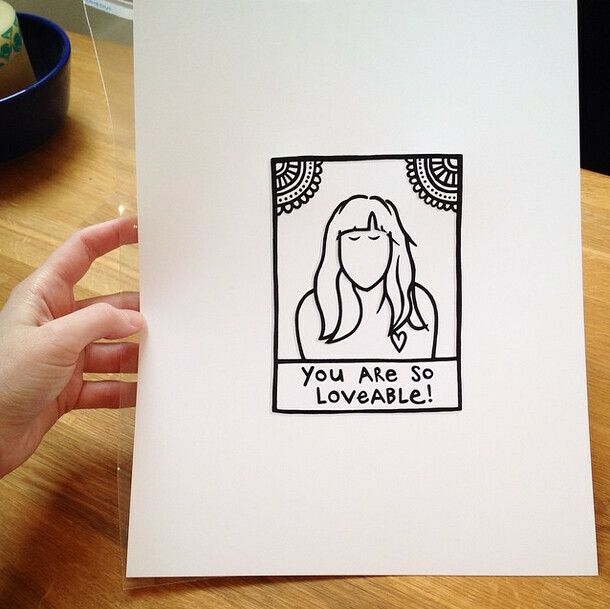 You can find the new You are so loveable! Heartgirl print in my Etsy shop. ps. A little note for the grammar nerds out there - you might be wondering if/why I misspelled loveable. Both spellings (with and without the 'e') are accepted, though without it is more common, particularly in the US. With the 'e' is more common in British English, though they also spell it both ways. For some reason, I just like how it reads with the 'e' better, that you actually see the word love in its entirety. Straight up personal preference!